The first stage starts from the first nuclear crisis until 2012. It is a stage of tactics manifestation that can be negotiated. The second stage begins from 2013 until the end of 2017, characterized by strategic directions, which are non-negotiable. The third stage, from the early 2018 to date, is the one with strategic issues that are negotiable. It should be emphasized that even in the second stage, “non-negotiable” does not mean that negotiation is out of the question under any circumstances. Instead, it means that North Korea deems that “underdeveloped” nuclear weapons are not sufficient to attain the satisfactory goals (security and development conditions). It is important to ascertain this because it directly roots out an assumption that the third-stage negotiation does not make sense and North Korea will not embark on denuclearization, based on the presumption that the second-stage nuclearization is not negotiable. 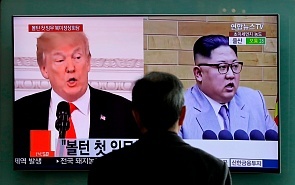 In fact, North Korea’s intentions of denuclearization were made certain in the first stage of the game, with both fundamental conditions in security and development. In light of the sub-topics on the current issue of denuclearization, “The Declaration of the End of War” and “Peace Accord” are aimed at “security conditions”, while lifting sanctions against the DPRK is aimed at “development conditions”. In the first half of each year, the U.S. and South Korea carry out two routine joint military exercises - the Foal Eagle and Key Resolve. On April 1, about 11,500 U.S. troops and 300,000 South Korean soldiers took part in the Foal Eagle joint military drills, which were delayed because of the Pyeongchang Winter Olympics and the Winter Paralympic Games. First, the exercises schedule was cut by half, and the number of strategic weapons delivered from the US was reduced remarkably. Second, the present versions of Foal Eagle and Key Resolve are more defensive-oriented rather than offensive-oriented. In a nutshell, the military exercises display more “routineness” of the US-South Korea military cooperation than a “purposeful demonstration of force". At the Third Plenary Session of the Seventh Central Committee held in April 2018, North Korea announced that it would stop carrying out nuclear tests and transfer its focus to “developing economy and enhancing people’s living standards”. This strategic decision, earlier than the DPRK-ROK and DPRK-US summits, signifies that North Korea’s denuclearization in exchange for “security” and “development” is sustainable with the absence of major turmoil on the peninsula. To the United States and South Korea, the North Korea nuclear issue is a “real threat” instead of “intentional threat”, which needs to be taken seriously. Therefore, denuclearization is the common aspiration of all parties and it is the process that involves odds. The ultimate target of the game of denuclearization on the Korean Peninsula is complete, verifiable, irreversible denuclearization (CVID) on the one hand, and North Korea’s obtained security and development conditions on the other. There is no problem with the result presumption, but the key lies in how to smoothly translate the game process into the ultimate target. In the first stage of the game, both the US and the DPRK labeled each other with untrustworthiness. In the negotiating of cooperation in the absence of strategic mutual trust, the general logic has it that “multiple games” in the “action-to-action” principle can better take care of the interests of both parties. Yet in fact, what the US wants is “one-shot game” instead of “multiple games”. It is possible to find out that the US makes a big concession only after North Korea has made many “small efforts”, which is the embodiment of the game logic：North Korea identifies “The Declaration of the End of War” as the “entrance to peace on the peninsula”. What’s more, after the June 12 Trump-Kim summit, the DPRK was active in submitting lists of nuclear facilities, dismantling the Yellow Sea satellite launch site and returning remains of the US soldiers. But the initiative of when and how to sign “The Declaration of the End of War” is still on the side of the US. Harry Harris, the US ambassador to South Korea, said on August 2 that “The Declaration of the End of War” is at the stage of probability, but its final announcement is conditioned on quantities of positive actions from North Korea in denuclearization. In the game of denuclearization of the peninsula, the United States is in the advantageous position. The fewer the number of games, the greater the risk is to North Korea and the more necessary the third-party guarantee should be involved. The issue of recent possible phased achievement – “The Declaration of the End of War” should not only give credit to China’s role as one of the concerned parties, but to the special logic of the game of denuclearization. This is the conclusion: the trend of denuclearization of the Korean Peninsula has taken shape, with a tortuous process, but bright and peaceful prospects.